As much as I want to be everything you need, I’m not always going to be. The following resources include massage therapists who might be more convenient, businesses I think are worth working with, and a few other offerings that I think are worth looking at in general. A practical and easily accessible guide for anyone in the healing arts (especially massage therapists), to help you set up and run a small but successful business. Filled with practical real-world explanations of basic business skills, it is written with warmth, humor, and an appreciation for the heart-led work of everyone in the health and wellness world. From bookkeeping to financing, business plans to contracts, the reader will find answers to the most basic questions: where do I start and how do I do that? When you love your healing work and need to learn how to run your business this book is the friend you need. The way to pay as little in taxes as possible is to take all the deductions that you can. This book shows you how that works and has more than 100 specific deductions, including commonly misunderstood deductions like home office, mileage, and travel. 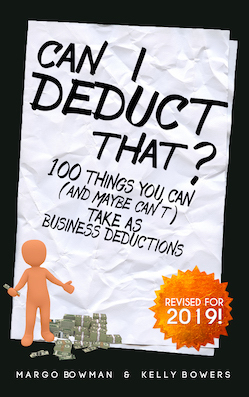 Perfect for the small (or even very very small) business owner who needs to know what's a valid deduction and what isn't. It's especially useful for businesses that provide services, such as massage therapists, yoga instructors, musicians, coaches, etc. If you'd rather let an accountant do it, the book also explains how to find an accountant that is a good fit for you and how to work with them most effectively. Keep as much of your business income as you can by taking all the deductions you're allowed to. My blog is where I share information, links, reflections, and important changes to my practice (in between my quarterly newsletters). It’s the place to come to see if anything new is happening in my practice (new techniques? new hours?). I also use this space to reflect on the joys and challenges of living in physical bodies in this physical world; a little something to make you think “hmmm, never thought of it that way”. If you want to get a glimpse into how my mind works and how I think about my work, the blog is a good place to get just that. Stretching, by Bob Anderson (illustrated by Jean Anderson). A user-friendly classic. “Mozart for Meditation” and “Mozart for Massage”. Compilation of relaxing Mozart pieces. The Alexander Technique. For getting to a balanced centered place with your body. AirBnB. An international company for people who want to rent out a bed or room in their place for the short– or long-term.